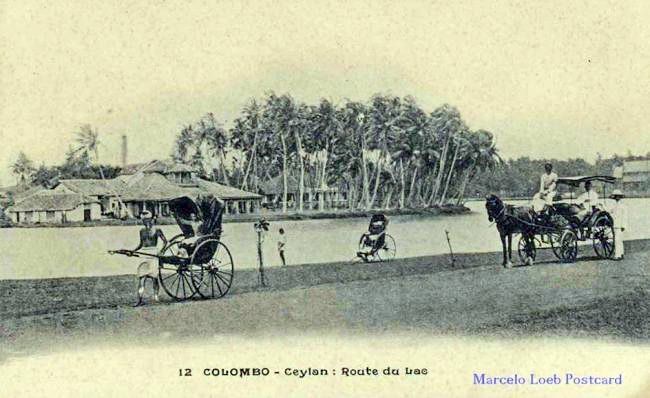 Ever wondered how Slave Island, one of downtown Colombo’s major hotspots today, got its name? It has neither slaves nor is an island as far as we can see. But then again, place-names rarely lie. They often reflect the reality that once was, capturing a loop in time as cleverly as Miss Peregrine’s Home for Peculiar Children. And so it is with Slave Island, which was once an island in a lake, or a sort of peninsula. And yes, it had slaves, plenty of them! Selkirk described Slave Island as a tongue of land in the Beira Lake, by which we may take to have meant something like an inland peninsula, where the land is surrounded by water on three sides. The renowned surveyor, R.L Brohier, in his Discovering Ceylon (1973) also held this view, inferring that it was a jagged peninsula that was miscalled in old Dutch maps as Ije meaning ‘island’. However, one could argue that at a certain point in history, it was indeed an island fully surrounded by water. This is suggested by some interesting stories left for us by a few writers of old and by the plain semantics of the term, for an island simply means an island! 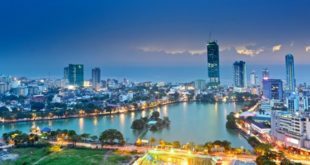 “Making first for the native quarter of Pettah, or Black-town, we pass picturesque Slave Island, which gets its name from the following incident. One night in the old slave times before the year 1844. the Kafir slaves in a certain house in the Fort, in consequence of cruel treatment, rose and murdered a whole family. Thenceforth, the slaves were every evening put into punts at sunset, and rowed to what was then an island, where they were kept under safe guard until the morning”. As Walters noted, prior to the abolition of slavery in 1845, slaves were not uncommon in Ceylon, especially during the days of the Dutch colonials. These black slaves were sourced mainly from East Africa, such as the Portuguese colony of Mozambique, and were used as servants and gardeners, among other things. The Dutchmen, after the incident related by Walters, could not enjoy a sound sleep, thinking that a Kafir (as they called their black slaves) might knife them in the dead of night, and so confined their slaves to an area called Kaffirs Veldt (Field of Slaves), which is the present Echelon Square whence the twin towers of the World Trade Centre rise skywards today. Come eventide, they would be rowed to the island in the lake to spend the night before being rowed back to the mainland and put to work. No slave dare escape as the Dutch stocked the lake with a few hungry crocodiles ever ready to make a meal of men. As a warning to their enslaved subjects, the Dutch also erected a high gibbet on an island in the lake known as ‘Captain’s Island’, where it could be seen from all sides. Thus, it is possible that at a certain point of time in our colonial history, Slave Island was really an island, or a jagged tongue of land jutting out into the lake on its southern side that was dredged to allow water to surround it like a large moat,perhaps even for the specific purpose of confining the slaves of the Dutch. If so, it would have been later filled to connect it to the mainland. From what we know, the point at which it was joined to the mainland was once called Union Place. 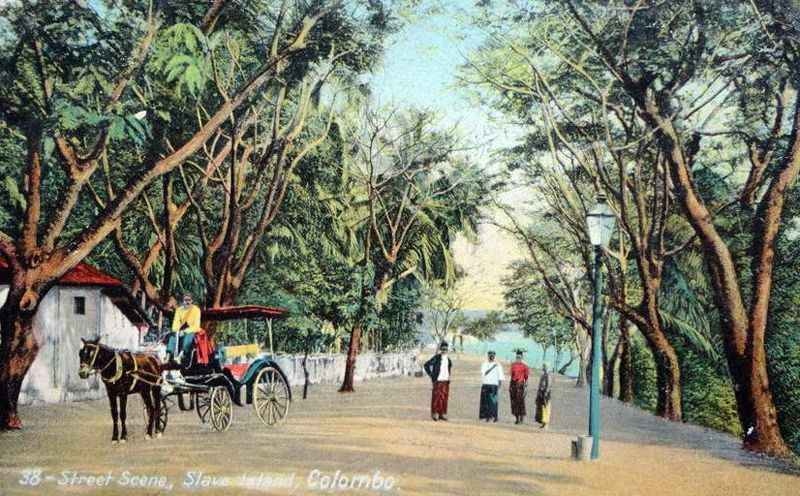 Leafing through Geoff Ells’ book on the origin of the city’s place names, Colombo Jumbo, this writer was surprised to learn that it was so called because in the olden days, Slave Island was connected by a road to the mainland by filling in a section somewhere where Union Place stands. This is a fascinating account of lost history, especially since Union Place has now been renamed Colvin R. De Silva Mawatha after a leftist leader who thrived thereabouts. And to think I once fondly believed that it was the place where the trade unions of old picketed for the rights of the working class as they do even today ‒ there really is so much history in place-names! Little is it known that Slave Island was once a very scenic spot much frequented by foreign visitors. That was during British times, when it earned a much better reputation than it did under the Dutch slave masters. Those were the days when pleasure barges, skiffs, and ferry boats operated by the Boustead Brothers sailed the Beira lake and overflowing families picnicked on its grassy banks. “Ferry-boats cross over from each side of the lake to the peninsula called Slave-island, and pleasure barges and canoes are continually sailing on this sheltered bason. Several gentlemen, whose habitations are situated on its borders, adopt this mode of going into the fort in the morning, and return home in the afternoon in the same manner. Many persons, whose duties confine them to the garrison, enjoy, occasionally, a pleasant recreation in accompanying their friends across the lake, and partake of a hospitable dinner, at four o’ clock, with particular relish in so charming a situation”. “It is numerously covered with cocoanut and other trees, which afford an excellent shade. That part nearest to the Fort is very cool, being separated from the sea by an isthmus, usually called the Galle face. 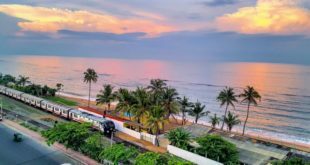 Communication from this place with either the town or the Fort is very easy by land, passing over a very pretty little stone bridge, which opens to the south end of the Galle face, near the village of Colpetty, or by boats which cross the lake in all seasons”. “Pass out that sultry and much to be shunned Fort of Colombo, bend your steps by its outworks towards the east, and you will come upon a piece of ground, jutting into, and nearly surrounded by a large fresh water lake, grass-planted and well-shaped with rows of tulip trees. This is Slave island, so called from its use during the Dutch dynasty in Ceylon”. The places where the ferries took off was until recently reflected in two street names of the area, Old Ferry Lane and New Ferry Lane. New Ferry Lane still exists, but one wonders what became of Old Ferry Lane. Slave Island was once the site of the country’s first botanical gardens, the Royal Botanical Gardens which was established in 1810, not very long after the British had taken Colombo. It was called Kew Gardens after the more famous garden of London. Perhaps the only reminder of this is Kew Road which seems to have been connected to the gardens and who knows, our Kew variety of pineapple which must have been first grown here. “The name “Kew” applied to a little peninsula jutting out into the lake, on which the quarters of the married sergeants of the Ceylon Rifles are situated, is due to the fact of a botanic garden having once existed here, traces of which still remain in the shape of large and handsome trees. Indeed Prince Soltykoff, the Russian traveler, described Colombo as one vast botanic garden, and the idea is not an unnatural one to men from cold northern regions, who see the blazing “flambeau tree” of Madagascar, the “cabbage tree of Java”, the graceful casuarinas of Australia and such convolvuli as the “morning glories” and the “moon flowers” of night intermingled”. There was also a large house named Kew here. 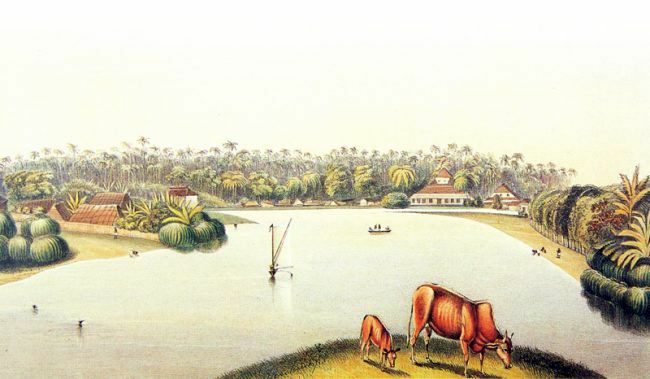 John Deschamps, a British army officer, in his Scenery and Reminiscences of Ceylon (1845) described Slave Island as being pleasant and commodious, with some elegant residences by the lake, foremost amongst which was the one called “Kew”. “Slave Island’s fame is for manipittu and babat. Manipittu is rice-flour baked inside a bamboo, and steamed. Babat is tripe in curry form. Indeed, Slave Island is quite a place for gourmets. Curry and rice is made most deliciously in the lowest eating shops”. He also refers to the “taste shop” under the command of an Amazon of a woman “where the bibber can stimulate his palate or break his hunger with prawns fried, liver boiled, gram roasted or boiled, pappadam (it feels and sounds like that when you eat it), eggs, tripe perhaps, boiled potatoes, chicken or duck. And there are draughts to play for those who linger on”. This writer remembers a time in the early 1980s, when his father would take the family out to dinner at this Malay eatery down Malay Street in Slave Island where they would enjoy a delicious mouth-watering meal of pittu with its traditional accompaniments of barbat, and coconut milk served us by a small-made, hunchbacked man. They also served a hot beef soup oozing with oil. The big bone that invariably came with the dish of soup had a yellowish marrow which one got at by sucking or scooping it out with the handle of a spoon. Slave Island was once a thriving Malay settlement, a fact that is still reflected in the street names, Malay Street and Java Lane. Rifle Street, now Justice Akbar Mawatha, was where the Ceylon Rifle Regiment was based until it was disbanded in 1873. The regiment, which was formed out of the Ceylon Malay Regiment, had a good number of Malay infantry soldiers in the service of the British. In fact, the Sinhala name for Slave Island, Kompanna Veediya, testifies to its Malay heritage, which may mean either company (of Malay soldiers who were stationed there) or the street of the ‘Kampong’, kampong being a Malay settlement. 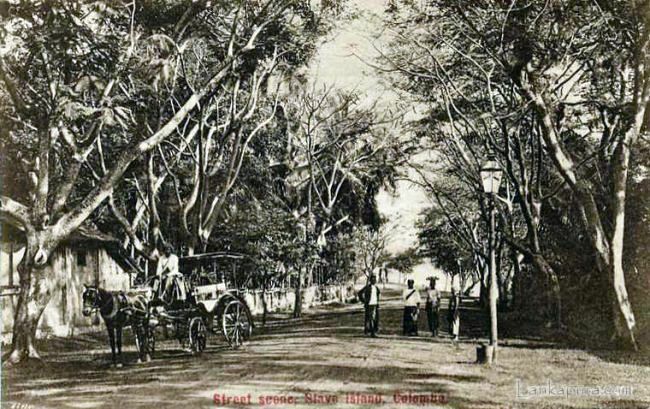 There is a belief that the street takes its name from the old company, Ceylon Cold Stores, or rather its predecessor, Ceylon Ice Company, which was founded way back in 1866 by Albert Von Possner, a German who put the fizz into drinks in Ceylon. The company, which started in Glennie Street in Slave Island where Possner lived, pioneered the manufacture of ginger beer in amber glass bottles and had soon grown to be a large food and beverage company, manufacturing under the Elephant brand. Thus, it is possible that the area was named after this company, since in the Sinhala language, kompanna may also mean ‘company’. However, this does not necessarily have to mean a commercial company. E.B. Denham in his Ceylon at the Census of 1911 (1912) observes that both the Sinhalese and Tamil names for Slave Island mean ‘The Company’s Street’ (Kompannavidiya in Sinhala and Kumpani Teruvu in Tamil) “probably from the company of gun lascars who had their lines there”. Thus, it is quite possible that it took its name from the company of Malay soldiers of the Ceylon Rifle Regiment who were stationed there. We have it from An Officer who says in his paper on the Ceylon Rifle Regiment published in the Colburns United Service Magazine of 1860, that the regiment was formed from several companies of Malay soldiers found in the pay of the Dutch East India Company at the capture of the maritime provinces of the island by the British in 1795-96. He records to their credit that “they were the only troops who offered any determined opposition to the British forces”. Very interesting is his observation that when the Ceylon Rifle Regiment was officially constituted in 1827, it was only the Malay portion of it that was armed with rifles, but these were not issued to the Sepoys of Indian origin until 1842 and the Caffres of African origin until 1848. Even until 1854 the Regiment was still dominated by Malays, who formed 11 companies, while two were formed by Sepoys and one by Caffres. In Slave Island, he says, stood a line of detached buildings, some improved, but some still of mud walls with roofs of the leaf of the coconut tree: “the barrack rooms of the single men of the Ceylon Rifle Regiment”. The married soldiers, he says, lived apart, but not far from their bachelor comrades, also in Slave Island, being provided with what were called ‘lines’: “blocks of brick and tiled buildings, divided into a number of separate rooms, one being allowed to each man, in which he resides with his wife, olive branches and heaven knows how many of his poor houseless relatives”. It is also possible that the name may be linked with the Malay kampong. In fact, until recently, the Malays called Slave Island Kampong Kertel, the term kertel itself being a corruption of the Portuguese quartel meaning ‘barracks’. The kampong itself was divided into a civilian area and a military area much like a cantonment. The military area was called Kampong Kew and the civilian area Bai-Kandi. The military area called Kampong Kew obviously took its name from Kew, the garden of that name that once occupied that locality, and ‘Bai-kandi’ is perhaps a Malay corruption of the Sinhala wekanda meaning ‘bank of a lake’, since Malay lacks the v or w sound (which is why even common loan words like bangsa or ‘race’ which derives from Sanskrit vangsa have a b instead of v). This is very likely, since the Wekanda area to this day stands in close proximity to the Beira Lake. At Wekanda stands a very old mosque dating back to 1786, which is still run by Malays. 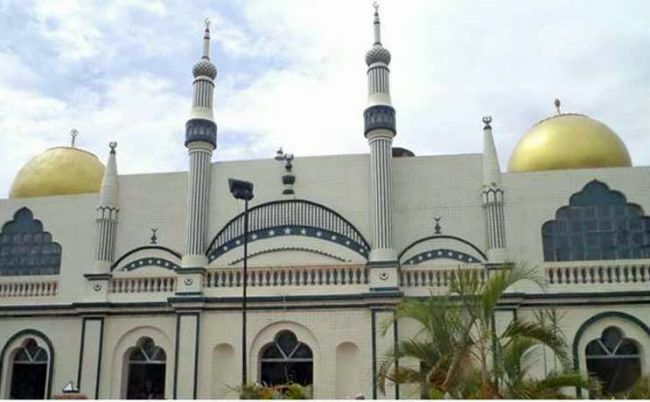 The Wekanda Jumma Mosque was, according to legend, built in the closing years of Dutch colonial rule in Sri Lanka by one Pandan Bali, a brave prince from Java who was exiled by the colonial power. A devout man, he married a local girl. As he had no offspring, he made a vow that he would build a mosque if he were blessed with a child. The happy couple was blessed with a baby girl and Pandan fulfilled his vow by building the mosque. The man may have been of Balinese origin as suggested by his name. 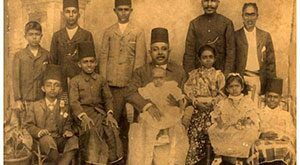 The Pallie family, a well-known family of Slave Island, traces its origins to him, but who knows ‘Pallie’ may also mean ‘mosque family’ since in local parlance palli means mosque or church, and we certainly know that Pandan Bali did build a mosque, according to the legend. Though a civilian area, Wekanda gave rise to some militant types every now and then, a throwback to the martial qualities of the Malay race. One such was a Malay woman named Maimoon, who lived in Wekanda in the 1930s and 1940s. A daring and dynamic speaker of the Ceylon Communist Party, she worked at Hendersons and was well known for rousing up workers during the World War II years. Today, Slave Island lives on, having outlived its days as a slave prison, military station, and botanical garden to become what it is today, a thriving cosmopolitan hub of leisure and commerce where life can be enjoyed in all its vigour and colour.